Although we talk about community supported agriculture (CSA) frequently in the pages of Grid, it’s a relatively new business model. First introduced into the U.S. in 1986, it offered a brilliant solution to a problem farmers regularly faced: cash flow. By encouraging consumers who wanted fresh produce to pay farmers in advance, the model bridged a gap in the winter and early spring when farmers had little to sell. When crops are ready to be harvested, consumers get a weekly box—a share of a wide variety of the freshest fruits and vegetables you can buy. It’s a big win for both the eater and farmer. While the model has proven to be a success, it can be challenging for customers to keep up. Unfamiliar vegetables need to be identified and researched before preparing, and if you have a busy week at work that keeps you out of the kitchen, the pile of vegetables can stack up quickly. This insight is one that led to the founding of Philly Foodworks, a distribution business created by Dylan Baird, Ryan Witmer and Jamal Bell, and the introduction of a hybrid CSA model. The consumer still pays in advance, so it remains economically beneficial to the farmer, but they can choose what they want, when they want it, making it less rigid. Philly Foodworks currently offers food from more than 30 producers within a 150-miles radius of the Philadelphia area. But it isn’t all about consumer choice. Ultimately their goal is to strengthen the bond between the rural grower and the urban buyer. Philly Foodworks is also trying to create a marketplace for the fledgling specialty food producer. Baird, Witmer and Bell met while working with landscape architect and “guerilla gardener” Skip Wiener at his Urban Tree Connection (UTC), an urban farm and community development organization in the Haddington area of West Philadelphia. The UTC has a mission to assist low-income, urban neighborhoods by transforming empty lots, most often through growing food. Together they launched Neighborhood Foods, a CSA program that eventually spawned Philly Foodworks. As their ambitions evolved from urban farming into a distribution model, it became clear to the Philly Foodworks founders that they needed to separate from UTC, where education is more important than business. For example, Baird mentions an incident when some students ruined a kale crop by uprooting the plants instead of harvesting the leaves. “[For] a subsidized nonprofit, that’s a learning experience, but as a business you can’t really deal with that,” he says. Wiener recognized the ambition and entrepreneurial spirit of Baird, Witmer and Bell, and encouraged them to pursue their own goals, especially when he saw the CSA growing to the point where it was becoming a distraction to Urban Tree Connection’s core urban farming mission. Each of the three bring their own expertise to the partnership: Baird, 24, a graduate of Temple University’s Fox School of Business, is interested in developing a financially viable model for local food distribution; Witmer, 28, was raised on his grandparents’ farm in Ohio and brings a lifelong knowledge of practical farming; and Bell, 63, has an extensive familiarity with retail and community outreach. He came to Philly Foodworks after starting an urban farm at the House of Umoja, a grassroots residential program for ex-gang members in West Philadelphia. He now operates Philly Foodworks’ weekly farmers market offerings in Northern Liberties’ Liberty Lands Park, and thus maintains a very direct connection to the company’s consumers. In 2013, before Neighborhood Foods evolved into Philly Foodworks, it won $125,000, professional services and products from Temple’s “Be Your Own Boss Bowl,” a university-wide business plan competition. Those funds allowed them to move into a 5,000-square-foot warehouse space in SHARE Food Program’s facility in North Philadelphia that now serves as Philly Foodworks’ headquarters. In late July, the space still showed evidence of the move, with accounting papers on packing pallets and plastic chairs hastily pulled up to a makeshift table. Remnants of the previous day’s CSA shipment were evident; Bell was busily stacking produce boxes that were strewn about, while Baird inventoried the leftover mushrooms, fruits and breads that remained in the walk-in freezer. The space also includes a dry storage room where the company keeps a variety of value-added products like pasta, jams and coffee. 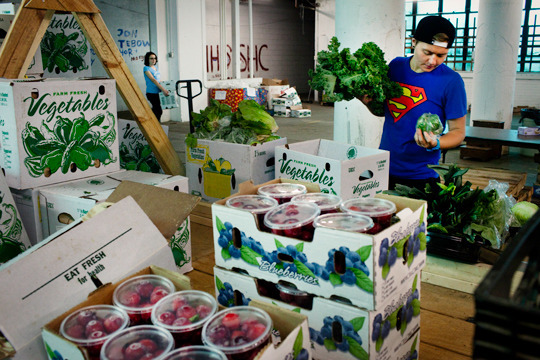 Philly Foodworks is also able to lend a financial hand to small-scale producers. For example, they bought mason jars in bulk and passed along the discount to their producers. They’ve also instituted a practice of paying for a season’s worth of produce up front, providing farmers with funds in the critical spring planting season without the burden of interest-bearing bank loans, in a sense expanding the usual CSA model. That initial investment is then paid back over the course of the season as deliveries are made to the CSA. “It’s as if you could pay off your loan to the bank with vegetables,” Baird says. The Philly Foodworks CSA offers three different share types. “Farmer’s Choice” utilizes the traditional CSA model, providing 10 items weekly depending on availability and changing with the seasons. “Mix Share” includes five items based on the same model, supplemented by credits to be used in Philly Foodworks’ online market, which sells a variety of products, including additional produce, baked goods, meats, herbs and natural medicine. “Your Choice” is a commitment to spend a set amount over the season but completely à la carte. Philly Foodworks also offers flexible payment terms for consumers, allowing payments in up to four installments rather than in a single lump sum; additional items can always be added to a share via the online market; home delivery is available in some sections of the city; and if vacation or other contingencies don’t allow for a pick-up during any given week, accounts will be credited with 48 hours’ notice. For the future, Philly Foodworks’ main focus is expanding their CSA, which currently delivers 400 shares, and adding a winter CSA to take the program year-round. In September, they’ll also take over a contract at Chestnut Hill’s private Crefeld School for which they’ll make lunch for students in the morning and have access to the school’s kitchen for the remainder of the day. They hope to use leftover produce and other items to make their own products, such as preserves, stew-in-a-bag preparations and sauces, either for inclusion in future CSA baskets or for sale to local retailers. Connection is key to Philly Foodworks’ social mission, which emphasizes creating community as much as healthy eating or supporting farmers. That’s apparent in their blog posts, which feature interviews with some of their frequent producers. 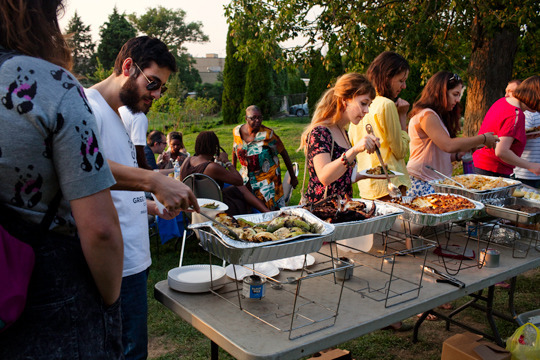 They also host community dinners, which bring together producers, CSA customers and supporters for a communal meal. They held their first in late July at Heritage Farms in Northwest Philadelphia. Customers were invited free of charge to enjoy a meal consisting entirely of food offered by the Philly Foodworks CSA. 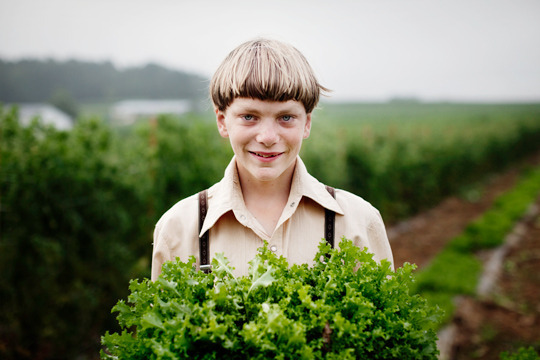 “The idea is that what you’re buying from the CSA is an experience,” Baird says, declaring their first dinner a success. That connection is also evident in how Philly Foodworks vets potential farms to supply their CSA.